Ligularia dentata (summer ragwort or leopardplant) is a species of flowering plant in the genus Ligularia and the family Asteraceae, native to China and Japan. It is a robust herbaceous perennial growing to 1–1.5 m (3–5 ft) tall by 1 m (3 ft) wide. The dark green leaves are large, long-stalked, leathery, cordate-based, and very rounded, with serrated edges (hence the Latin dentata meaning "toothed") . 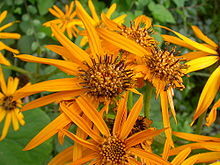 Orange-yellow daisy-like composite flowers bloom on thick red, mostly leafless stalks, rising above the foliage in early summer. Ligularia dentata is grown as an ornamental plant, chosen as much for its bold foliage as its flowers. It is used as a round-leaved accent plant or massed planting in moist sun and partial shade garden settings, and in containers. Cultivars include 'Desdemona' and 'Othello'. Selections with cream colour spotted foliage (polka dots) are also grown. Ligularia dentata 'Desdemona' - cultivar foliage. Ligularia dentata, in massed natural landscaping. Ligularia dentata contains tumorigenic pyrrolizidine alkaloids. ^ Natural Resources Conservation Service (NRCS). "PLANTS Profile, Ligularia dentata". The PLANTS Database. United States Department of Agriculture. Retrieved 2008-05-21. ^ Botanic Garden and Botanical Museum Berlin-Dahlem. "Details for: Ligularia dentata". Euro+Med PlantBase. Freie Universität Berlin. Retrieved 2008-05-21. Wikimedia Commons has media related to Ligularia dentata. This page was last edited on 18 April 2018, at 16:34 (UTC).